Bringing abundant computation and communication, as pervasive and free as air, naturally into people's lives. In the future, computation will be human-centered. It will be freely available everywhere, like batteries and power sockets, or oxygen in the air we breathe. It will enter the human world, handling our goals and needs and helping us to do more while doing less. We will not need to carry our own devices around with us. Instead, configurable generic devices, either handheld or embedded in the environment, will bring computation to us, whenever we need it and wherever we might be. As we interact with these "anonymous" devices, they will adopt our information personalities. They will respect our desires for privacy and security. We won't have to type, click, or learn new computer jargon. Instead, we'll communicate naturally, using speech and gestures that describe our intent ("send this to Hari" or "print that picture on the nearest color printer"), and leave it to the computer to carry out our will. New systems will boost our productivity. They will help us automate repetitive human tasks, control a wealth of physical devices in the environment, find the information we need (when we need it, without forcing our eyes to examine thousands of search-engine hits), and enable us to work together with other people through space and time. eternal—it must never shut down or reboot; components may come and go in response to demand, errors, and upgrades, but Oxygen as a whole must be available all the time. Oxygen enables pervasive, human-centered computing through a combination of specific user and system technologies. Oxygen's user technologies directly address human needs. Speech and vision technologies enable us to communicate with Oxygen as if we're interacting with another person, saving much time and effort. Automation, individualized knowledge access, and collaboration technologies help us perform a wide variety of tasks that we want to do in the ways we like to do them. Oxygen's device, network, and software technologies dramatically extend our range by delivering user technologies to us at home, at work or on the go. Computational devices, called Enviro21s (E21s), embedded in our homes, offices, and cars sense and affect our immediate environment. Handheld devices, called Handy21s (H21s), empower us to communicate and compute no matter where we are. Dynamic, self-configuring networks (N21s) help our machines locate each other as well as the people, services, and resources we want to reach. Software that adapts to changes in the environment or in user requirements (O2S) help us do what we want when we want to do it. Devices in Oxygen supply power for computation, communication, and perception in much the same way that batteries and wall outlets supply power for electrical appliances. Both mobile and stationary devices are universal communication and computation appliances. They are also anonymous: they do not store configurations that are customized to any particular user. As for batteries and power outlets, the primary difference between them lies in the amount of energy they supply. Collections of embedded devices, called E21s, create intelligent spaces inside offices, buildings, homes, and vehicles. E21s provide large amounts of embedded computation, as well as interfaces to camera and microphone arrays, large area displays, and other devices. Users communicate naturally in the spaces created by the E21s, using speech and vision, without being aware of any particular point of interaction. Handheld devices, called H21s, provide mobile access points for users both within and without the intelligent spaces controlled by E21s. H21s accept speech and visual input, and they can reconfigure themselves to support multiple communication protocols or to perform a wide variety of useful functions (e.g., to serve as cellular phones, beepers, radios, televisions, geographical positioning systems, cameras, or personal digital assistants). H21s can conserve power by offloading communication and computation onto nearby E21s. Initial prototypes for the Oxygen device technologies are based on commodity hardware. Eventually, the device technologies will use Raw computational fabrics to increase performance for streaming computations and to make more efficient use of power. Networks, called N21s, connect dynamically changing configurations of self-identifying mobile and stationary devices to form collaborative regions. N21s support multiple communication protocols for low-power point-to-point, building-wide, and campus-wide communication. N21s also provide completely decentralized mechanisms for naming, location and resource discovery, and secure information access. The Oxygen software environment is built to support change, which is inevitable if Oxygen is to provide a system that is adaptable, let alone eternal. Change is occasioned by anonymous devices customizing to users, by explicit user requests, by the needs of applications and their components, by current operating conditions, by the availability of new software and upgrades, by failures, or by any number of other causes. Oxygen's software architecture relies on control and planning abstractions that provide mechanisms for change, on specifications that support putting these mechanisms to use, and on persistent object stores with transactional semantics to provide operational support for change. Speech and vision, rather than keyboards and mice, provide the main modes of interaction in Oxygen. Multimodal integration increases the effectiveness of these perceptual technologies, for example, by using vision to augment speech understanding by recognizing facial expressions, lip movement, and gaze. Perceptual technologies are part of the core of Oxygen, not just afterthoughts or interfaces to separate applications. Oxygen applications can tailor "lite" versions of these technologies quickly to make human-machine interaction easy and natural. Graceful interdomain context switching supports seamless integration of applications. Automation technologies, which offer natural, easy-to-use, customizable, and adaptive mechanisms for automating and tuning repetitive information and control tasks. For example, they allow users to create scripts that control devices such as doors or heating systems according to their tastes. Collaboration technologies, which enable the formation of spontaneous collaborative regions that accommodate the needs of highly mobile people and computations. They also provide support for recording and archiving speech and video fragments from meetings, and for linking these fragments to issues, summaries, keywords, and annotations. Knowledge access technologies, which offer greatly improved access to information, customized to the needs of people, applications, and software systems. They allow users to access their own knowledge bases, the knowledge bases of friends and associates, and those on the web. They facilitate this access through semantic connection nets. The following scenarios illustrate how Oxygen's integrated technologies make it easier for people to do more by doing less, wherever they may be. Hélène calls Ralph in New York from their company's home office in Paris. Ralph's E21, connected to his phone, recognizes Hélène's telephone number; it answers in her native French, reports that Ralph is away on vacation, and asks if her call is urgent. The E21's multilingual speech and automation systems, which Ralph has scripted to handle urgent calls from people such as Hélène, recognize the word "décisif" in Hélène's reply and transfer the call to Ralph's H21 in his hotel. When Ralph speaks with Hélène, he decides to bring George, now at home in London, into the conversation. All three decide to meet next week in Paris. Conversing with their E21s, they ask their automated calendars to compare their schedules and check the availability of flights from New York and London to Paris. Next Tuesday at 11am looks good. All three say "OK," and their automation systems make the necessary reservations. Ralph and George arrive at Paris headquarters. At the front desk, they pick up H21s, which recognize their faces and connect to their E21s in New York and London. Ralph asks his H21 where they can find Hélène. It tells them she's across the street, and it provides an indoor/outdoor navigation system to guide them to her. George asks his H21 for "last week's technical drawings," which he forgot to bring. The H21 finds and fetches the drawings just as they meet Hélène. Jane and her husband Tom live in suburban Boston and cherish their independence. As they have advanced in age, they have acquired a growing number of devices and appliances, which they have connected to their E21. They no longer miss calls or visitors because they cannot get to the telephone or door in time; microphones and speakers in the walls enable them to answer either at any time. Sensors and actuators in the bathroom make sure that the bathtub does not overflow and that the water temperature is neither too hot nor too cold. Their automated knowledge system keeps track of which television programs they have enjoyed and alerts them when similar programs will be shown. Just before their children moved away from the area, Jane and Tom enhanced their H21 to provide them with more help. Tom uses the system now to jog his memory by asking simple questions, such as "Did I take my medicine today?" or "Where did I put my glasses?" The E21's vision system, using cameras in the walls, recognizes and records patterns in Tom's motion. When Tom visits his doctor, he can bring along the vision system's records to see if there are changes in his gait that might indicate the onset of medical problems. Jane and Tom can also set up the vision system to contact medical personnel in case one of them falls down when alone. By delivering these ongoing services, the E21 affords peace of mind to both parents and children. Oxygen technologies are entering our everyday lives. Following are some of the technologies being tested at MIT and by the Oxygen industry partners. A prototype H21 is equipped with a microphone, speaker, camera, accelerometer, and display for use with perceptual interfaces. RAW and Scale expose hardware to compilers, which optimize the use of circuitry and power. StreamIt provides a language and optimizing compiler for streaming applications. The Cricket location support system provides an indoor analog of GPS. The Intentional Naming System (INS) provides resource discovery based on what services do, rather than on where they are located. The Self-Certifying (SFS) and Cooperative (CFS) File Systems provide secure access to data over untrusted networks without requiring centralized control. Trusted software proxies provide secure, private, and efficient access to networked and mobile devices and people. Decentralization in Oxygen aids privacy: users can locate what they need without having to reveal their own location. GOALS is an architecture that enables software to adapt to changes in user locations and needs, respond both to component failures and newly available resources, and maintain continuity of service as the set of available resources evolves. GOALS is motivated, in part, by experience gained with MetaGlue, a robust architecture for software agents. Multimodal systems enhance recognition of both speech and vision. Multilingual systems support dialog among participants speaking different languages. The SpeechBuilder utility supports development of spoken interfaces. Person tracking, face, gaze, and gesture recognition utilities support development of visual interfaces. Systems that understand sketching on whiteboards provide more natural interfaces to traditional software packages. Haystack and the Semantic Web support personalized information management and collaboration through metadata management and manipulation. ASSIST helps extract design rationales from simple sketches. 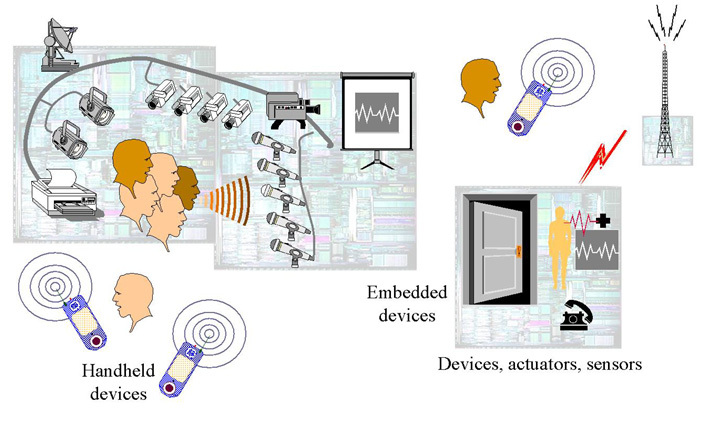 The Intelligent Room is a highly interactive environment that uses embedded computation to observe and participate in normal, everyday events, such as collaborative meetings. True innovation in Oxygen comes from MIT students, researchers, and others using Oxygen technologies and systems for their daily work. Hence Project Oxygen is building a system to use, and using it to build.